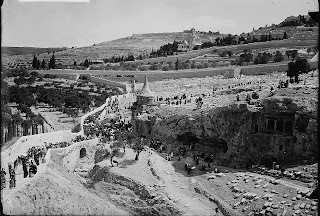 An estimated 150,000 Jews have been buried on the Mount of Olives over the last 3,000 years, opposite the Golden Gate of the city and the Temple Mount. 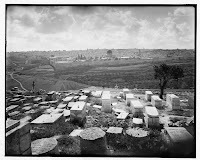 The ancient cemetery was favored by the devout as their burial site because of its proximity to the holy site in anticipation of the eschatological resurrection of the dead. 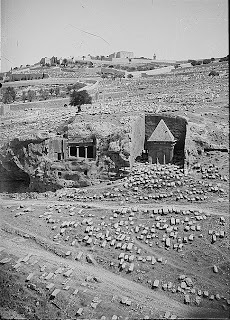 The American Colony collection contains many pictures of the Kidron Valley between the Temple Mount and the Mount of Olives, particularly around the picturesque shrine called "Absalom's Pillar." And the photographers captured pictures of mourners from various vantage points. 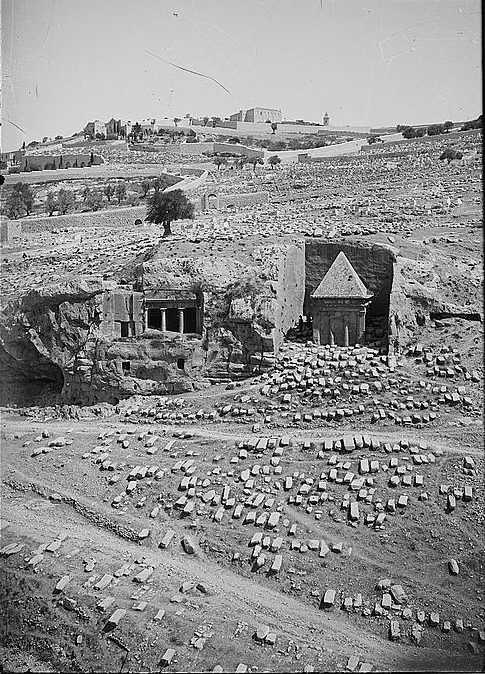 "Jewish tombs on the Kidron slopes"
Until 1917, Palestine was ruled by the Ottoman Turks; from 1﻿917 until 1948 it was under British control. 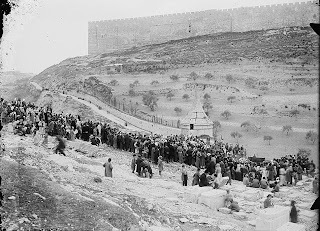 The Turks often discriminated against the Jews (one governor ordered the burial of dogs in a Jewish cemetery in Jerusalem-- "with the other dogs") and expelled thousands of Jews from Jaffa. The "Tyrant" Hassan Bek used Jewish gravestones to build a mosque between Jaffa and the new Tel Aviv, shown in photos from 1917. When Jordanian troops captured eastern Jerusalem in 1948, they followed Hassan Bek's example and used the Jewish gravestones for their construction needs. After the recapture of eastern Jerusalem in 1967, Jews were shocked at the widespread descration of the ancient cemetery. 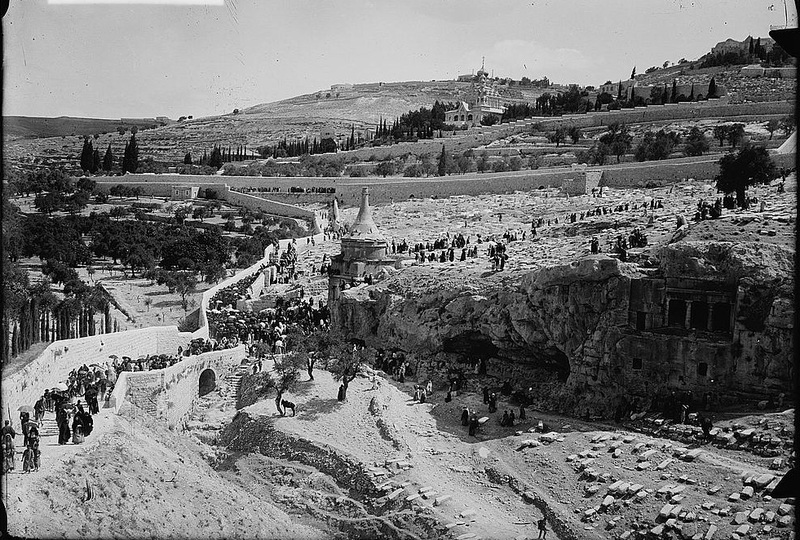 Some 38,000 stones and graves were smashed. Since then great efforts were made to restore the graves and tombstones. 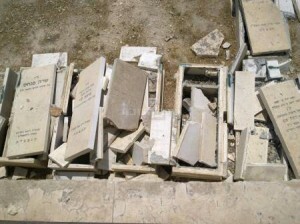 Today, Jews are once again burying their dead in the Mount of Olives cemetery, but they are shocked to find gravestones being vandalized and destroyed once again by Arabs who live nearby. Visitors to the cemetery have also found themselves under a hail of stones. Here is a video clip of the desecration actually taking place. Len, the Israeli foreign ministry published a booklet after the Six Day War with photos of the desecration on the Mt of Olives, such as gravestones used to build a latrine for the Jordanian Arab Legion. It's a tragedy that Israel allowed the Arabs to build freely in Silwan and make it into this huge ugly out of control neighborhood right next to the most historic and sacred sites in Jerusalem.